Carolyn Staudt is a curriculum designer for technology- and Internet-based projects, including Technology Enhanced Elementary and Middle School Science (TEEMSS 1 & 2), JASON Academy, Modeling Across the Curriculum, Models and Data, Mobile Inquiry Computing, Center for Innovative Learning Technologies (CILT), Science Learning in Context (SliC), Virtual High School, Global Learning and Observations to Benefit the Environment (GLOBE), Kids as Global Scientists (KGS), and NetAdventure at the Concord Consortium. She is especially intrigued with allowing students to collect real-time data with portable sensors and probes attached to desktop and handheld computers. 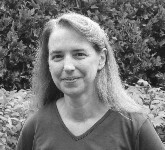 She has designed professional development that includes implementation of technology into the classroom curriculum, teacher and student utilization of existing software, design of tailored activities, and manipulation of software up to, and including, scripting as vice president of KidSolve, Inc. She has 20 years of experience teaching science and math, including physics, chemistry, geoscience, and space science. She holds a master’s of education in Curriculum and Instruction in Science from Kent State University. She was a Christa McAuliffe Fellow in 1990 and the Fairlawn, Ohio, Citizen of the Year in 1991.